Are you reading the fine print? Skipping it could be a bad idea for your health, especially in Philadelphia and other areas where that fine print contains important information: The city’s chain restaurants are required to post information about calories, fat and other nutrients on their menus. A new study published by a team led by the Drexel University School of Public Health evaluated how people use these menu labels in full-service restaurants. You can read the press release for the basic summary of their findings. Here, we sit down with the lead author, Amy Auchincloss, PhD, and co-author Beth Leonberg, to discuss more aspects of the study and its implications. 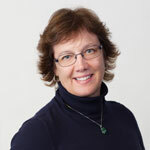 Auchincloss, an epidemiologist, is an assistant professor in the Drexel University School of Public Health, and Leonberg, a registered dietitian, is an assistant clinical professor in the Department of Nutrition Sciences in Drexel’s College of Nursing and Health Professions. Auchincloss: Consumer surveys suggest widespread support for nutritional labeling on restaurant menus, but research to date has found limited consumer response in fast-food settings. Overall, differences in fast-food calories purchased before and after mandatory labeling haven’t been noteworthy – either not statistically significantly different or were of small magnitude – for example 38 calories or even less. In contrast, our study in full-service restaurants found about 155 fewer calories purchased among customers who dined at labeled restaurants compared to unlabeled restaurants. About 35 percent of customers who reported seeing labels said that nutritional information influenced their ordering decision and those customers purchased 400 fewer calories than others who dined at the labeled restaurants but didn’t use labels. This was a large difference: a relative difference of 20 percent. 1. Full-service customers spend more time reading menus and so a higher proportion of customers see the labels. In contrast fast-food customers have fewer choices and many know in advance what they want to order so they don’t even look at the menu board. 2. Full-service customers purchase more calories (about 1,800 calories vs. about 900 calories of fast food). Focus group responses, collected in a companion study, found that most participants didn’t fully understand the labels but said they were alarmed by numbers that had four digits — were in the thousands. Calorie labels on fast food menu boards tend to be numbers in the high hundreds — so may get less attention. And 3., the full-service restaurant customer group included higher income and education groups, who generally are more likely to understand the numbers and to use labels. Leonberg: Most consumers do not know recommended dietary reference intakes (DRIs). Educating consumers about one to three DRIs may motivate label use among non-users and elicit a stronger response among label users. If consumers remember no other number, they need to remember “2,000” because 2,000 calories is all most people need for an entire day. Numerous research studies have documented that most people don’t know this basic fact so they don’t understand how high many restaurant items are. Auchincloss: Nevertheless, it is well known that knowledge alone does not drive food choice. Changes in the nutritional quality of restaurant menus – in particular, reductions in portion sizes by restaurant chains – could help to reduce customers’ caloric intake irrespective of whether customers use nutritional labels. Auchincloss: My colleagues at Drexel and the Philadelphia Department of Public Health are invested in translating our work into practical recommendations for restaurants and for consumers. We encourage restaurants to reduce portion sizes of regular entrees, reduce salt used in food preparation and enhance the restaurant’s appeal to the health-conscious consumer by offering a wider variety of healthier-choice items and aggressively promoting those items in pictures and promotional materials. Restaurants can also ensure that healthier-choice items adhere to standards for calories, sodium and saturated fat. You can read our recommendations in more detail in our executive summary: http://drexe.lu/1dOexFa. Leonberg: Dining out or buying prepared meals has become a routine part of the diet for most Americans. Where this type of choice was once viewed as a “splurge,” it occurs so often that most of us can no longer afford to treat it that way. Instead, we need to be able to make choices that can fit within an overall healthy diet. In order for that to happen, consumers need both the nutrition information about their options and some standards for comparison. When we look at packaged foods, we find the required nutrition labels provide reference values to put each nutrient in perspective. We need to have access to that information when we eat out, so we can use it in the same way. In general, most healthy adults should aim for about 2,000 calories a day. This is the calorie level on which nutrient values are based on packaged food labels. While someone who is smaller or less active will need fewer calories, and someone who is larger or more active will need more, 2,000 calories is a reasonable guideline. 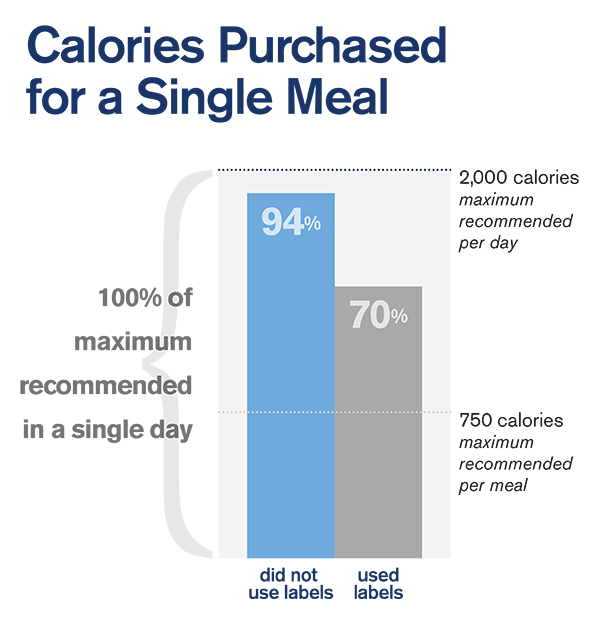 When eating out, if nutrition labeling is available, it’s easy enough for consumers to know that they will exceed their recommended intake for the day if they choose an entrée that provides more than one third to half of their calories in a single meal. One thing to keep in mind is that American restaurants typically provide portions far in excess of what would be considered healthy. Registered dietitians often recommend that diners opt to take home half the portion to eat at another meal when possible, to avoid consuming oversized portions. Another option is to ask for the food to be prepared with minimal fat or salt, or to have sauces served on the side. In restaurants where nutrition labeling is not available, consumers who are interested can ask the server if the chef can provide the nutrient content (consumer demand may lead to more labeling), or make use of popular smart phone apps like MyFitnessPal to look up the calorie content of their choices. To learn how to use labels and eat healthier when dining out, visit the Philadelphia Department of Public Health’s “Food Fit Philly” site at http://www.foodfitphilly.org/menu-labeling/.